Cherrytree/A&M Records/Universal Music Group is pleased to announce 'Sting: 25 Years', the definitive box set collection slated for release on September 27, 2011. Featuring three CDs comprised of 45 remastered tracks personally curated by Sting, a previously unreleased live concert DVD and a comprehensive hardcover book, this retrospective captures for the first time both the highlights and rarities of Sting’s enduring solo career. This consummate collection contains selections spanning his entire solo catalog, from his 1985 debut album, 'The Dream Of The Blue Turtles', to his latest release, Live in Berlin. Highlights include all of Sting’s top 40 hits as well as Grammy® winners 'Brand New Day', 'The Soul Cages', 'If I Ever Lose My Faith In You', and 'Whenever I Say Your Name' featuring Mary J. Blige (full track listing included below). 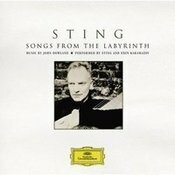 Sting: 25 Years was produced by Rob Mathes and Executive Produced by Sting’s longtime manager, Kathryn Schenker. The box set also contains nine songs remixed by Robert Orton and Steve Fitzmaurice exclusively for this collection. Rough, Raw & Unreleased: Live At Irving Plaza, the previously unreleased live concert DVD, features 10 tracks culled from newly unearthed raw performance footage filmed in New York City on the final night of Sting’s U.S. 'Broken Music' tour in 2005. The discs are housed in a beautiful, lavish hardcover book containing intimate and rare photos from world renowned photographers, complete lyrics, personal commentary and a newly written introduction by Sting. Richly diverse in musical content and visually captivating, 'Sting: 25 Years' is a compelling tribute to the restless spirit of an artist who continues to evolve and explore new musical territory. 3. Why Should I Cry For You?